Helps improve your lawn's soil condition. Beautiful lawns grow from healthy soil, improve your lawn with topdressing. What is it? It is the process of adding a fine layer of compost or a composite mixed soil to the surface of the lawn. At Prestige, we use a material called “Garden Gro Compost” from Remington Mulch. Why is it needed? There are many benefits: It increases microbial activity. It stimulates the grass to produce new shoots that result in a denser grass cover which helps combat the onset of moss and weeds. It builds up the quality of the soil over time. It will assist clay soils to drain better thus improving root development, and sandy soils to better resist drought by retaining more moisture. 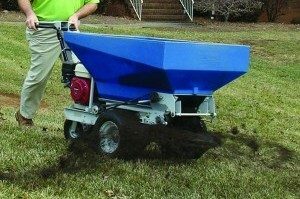 Lawns with poor soil conditions will benefit from having top dressing done annually for multiple years, and lawns with good quality soil should get it done occasionally. How is it done? It can be applied by hand with a shovel and rake, or with the use of a specialized spreading machine. Either way, it is important to get an even spread to make sure that too much topdressing material does not remain on top of the grass. Raking and/or blowing afterwards can help even things out. When should it be done? Technically, it can be done at any time. However, the most efficient time is along with an Aeration/Overseeding operation (Which is best done late-August thru mid-October). That way, not only do you get all the benefits of topdressing, but the topdressing material will penetrate deeper due to the aeration holes, and it will also help the seed germination process by protecting the seed and keeping it moist longer. For these reasons, Prestige only offers Topdressing during the Aeration/Overseeding time-window. If you are looking to have a really top quality lawn, ask our sales team about including topdressing annually or at least this year. It would be our pleasure to work up a Free Quote.